Hi everyone! I just realized I hadn't done a post in a couple of days or so, but as you can see I've been doing a "bit of dreaming". OK, I know I should be putting finishing touches on the shop, preparing the menu of cookies and treats that are to be served for the Open House; however everyone deserves a bit of a break right? 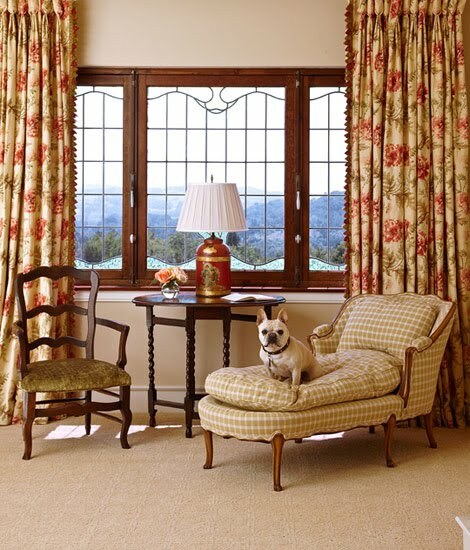 I was pouring through Traditional Home the other day and discovered some great pictures of things I would enjoy having around my home. In this picture I adore the plates on the wall. Although, I'm more fond of blue plates in my decor this same concept would work around an antique mirror I have hanging in the guest bedroom. With my love for books this balcony bookcase would feel many of my needs to be able to display a lot more of them. Love the hanging chandy. 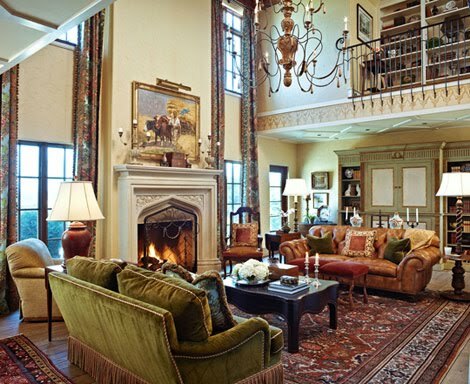 Although the ceilings appear to be quite high I think the rug grounds everything and gives a feeling of warmth to such a large room. What do yo think of the mismatched sofas? Isn't the horse statue gorgeous? I'm not too crazy about the wallpaper are you? 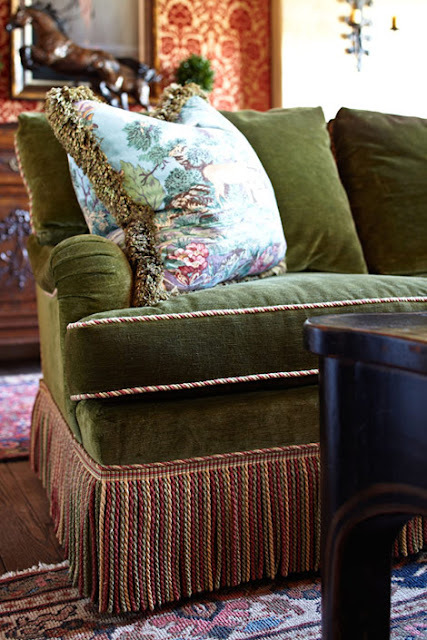 I'm sure you spotted this green sofa in the previous pictures, I wanted to share the "gorgeous" bouillon fringe. The added piping on the cushions is a nice touch. Wow! I love this center island. 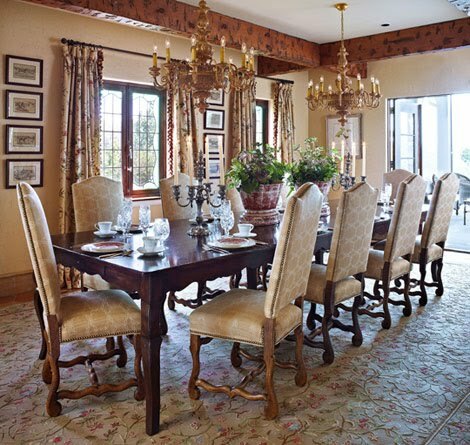 Can you imagine yourself gathered around this for the holidays all decked out with the turkey and trimmings? I'm wondering do you think the fridge is hidden behind that gorgeous armoire? 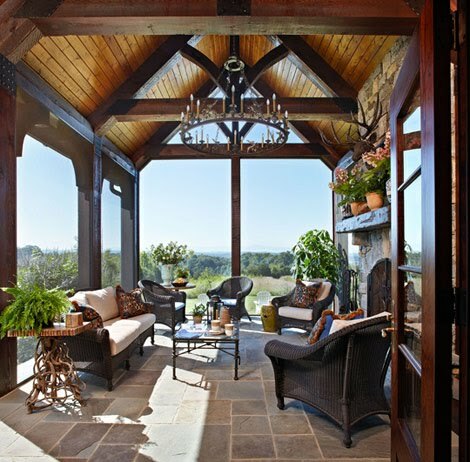 You could sure enjoy sitting here after a large meal and visiting over coffee and dessert. I love the centerpieces. Let's take our coffee and head outside for a visit. What a view! All this dreaming has me plum tuckered out. These are stunning pictures, Lynne. I should pick up this magazine and do some dreaming myself. I love the windows above the bed in the first shot. I would love to hang plates but I'm not sure where. Or what! Love the living room and vaulted ceiling, and yes, I would use 2 different couches as long as they went well together and tied everything else in. And of course, that is a dream kitchen!! I hope you are having a lovely weekend. I give you permission to put off that baking to just enjoy yourself!! I love this rich bullion fringe on sofas...thought about adding some to my sofa...it would be less expensive to buy another sofa!!! Gorgeous photos and we all need to dream!!! Hope your open house at the shop goes well and have a great weekend. So many beautiful rooms. Thanks for sharing the inspiration pictures. Have a wonderful open house - would love to be there. Beautiful dreaming there....yep, I bet that is the fridge and did you notice the wonderful tile flooring there also. 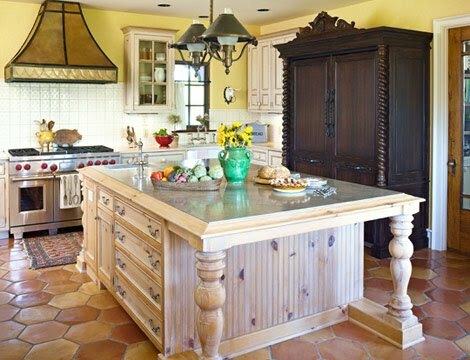 That is one gorgeous kitchen...oh, yes...to dream!! Just loved dreaming with you! I do love the green fringe couch. Not so much the wallpaper. 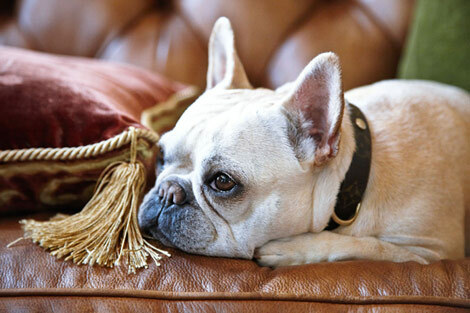 Adore the fainting couch. I love browsing through other peoples homes and dreaming about the possibilities, and also looking for inspiration! I once read somewhere that having a dream is the first step towards making it come true! The unmatched sofas look okay in that large room, but I know I would probably have trouble with actually using unmatched sofas myself. 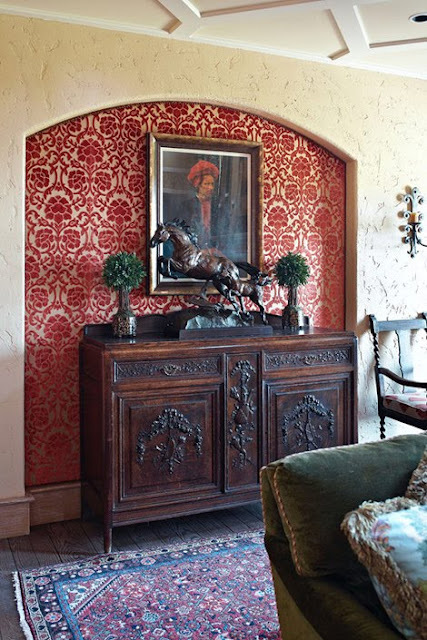 I love the horse statue too and the buffet it sitting on, but I have to agree with you on the wallpaper! I do like the pattern and of course the red , but it must be that it's flocked wallpaper that I'm not crazy about. Love to look at photos and get new ideas. Would love to add that fringe to my couch as it is about the same color. Have a great week. Yeah, I could live without that wallpaper but that's an easy fix, I'll take it as is! Gorgeous pictures and you've reminded me that I have my issue sitting here still to be looked through!